Happy birthday Photoshop ... 20 years old yesterday. Where would we be without it? Lots to enjoy on the web including Streakr and adobe tv. If you really have time to kill you can watch a full film of Thursday's 20th anniversary party in San Francisco (all two hours of it) on Photoshop 20th party. Even if you're not a geek the Russell Brown presentation is very clever. 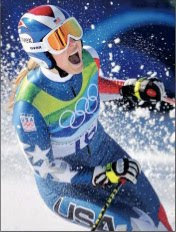 One picture dominated the American front pages this week - Lindsey Vonn's look of elation as she crossed the line to collect Gold in the women's Olympic downhill. 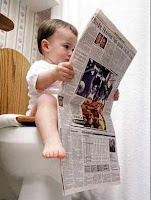 Most of the papers used it ... but at different sizes, in different positions and with different crops. In our Training tips we look at 12 front pages and their different approaches. 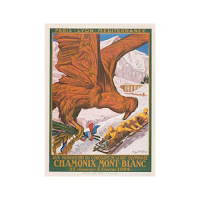 Nice idea - all the official Winter Olympic posters since 1924. The older ones do it for us ... particularly Chamonix, 1924, Oslo 1952 and Nagano 1998. What does that tell you? Albertville and Lillehammer - the computer has a lot to answer for. Worth a visual page in the sport sections? The world's best designed newspapers were named this week. Two of the top three are German, all are big read newspapers with traditional titlepieces, serif display and have swathes of space to play with. There isn't a tabloid or compact to be seen. Equally scarce are any advertisements. 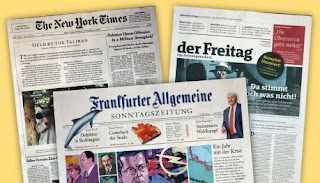 The winners, chosen, from 240 entries, are der Freitag (Berlin), Frankfurter Allgemeine Sonntagszeitung, and The New York Times. It's a real accolade for der Freitag which is a weekly with a circulation of 12,400. Take a look at the pages in detail on Flickr on Society for News Design and let us know what you think. Press Association Training is setting up a second foundation course for journalists. The Newcastle course will continue but there is to be a parallel course in London. Makes sense. Details on the Pencil Sharpener. ... from Peter Preston in the Observer. Number of working journalists killed on duty through the noughties: 725. ... such as encourage young people into the profession by arranging screenings of “All The President’s Men” and “The Insider” while balancing this with the realities of the current state of the profession by throwing them down a flight of stairs afterward. Or... when in doubt, pun. Very black humour from the Shark Guys. The Mail's reporters' training scheme will begin at the end of August. An advert is going in Media Guardian on Monday. For the last seven years the Daily Mail has recruited trainee subs, sent them to me and my colleagues at Press Association Training, for five weeks intensive subbing training followed by a secondment to a big regional newspaper. If they make the grade, which the vast majority do, they land a sub's job at Northcliffe House. The scheme is running again this year and the Mail is recruiting now. 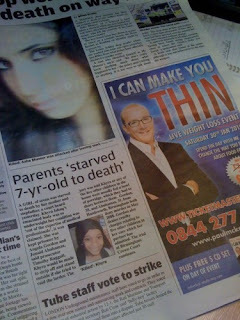 The advert was in The Guardian on Monday Mail training scheme. The closing date is March 5. The reporters training scheme, which began two years ago, is also running again. Hull Daily Mail this week - running a subbing and layout course for members of the hub. Might try to take in Derby v Newcastle on Tuesday. Also putting together a 24-page Champions League supplement for the Irish Examiner and writing an article on 'radical revenue ideas for newspapers' for InPublishing magazine. The idea was inspired by Will Lewis's team in Euston who are charged with, among other things, using the Telegraph brand to "capitalise on cutting-edge ideas, driving new revenue streams by better serving our customers". This is proving a tough one to write. If anyone has come across really innovative ways for newspapers to make money, I'd love to hear them (but then, I guess, wouldn't everyone). Those of you who get irritated by apostrophe abuse might enjoy this. It's St James's of course ... why penalise James just because his name ends in an s? If they reinstated the 's we might win something. Good spot from our old friend George Dearsley. 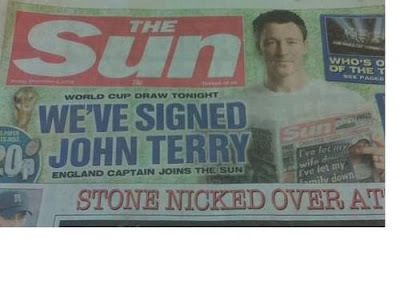 John Terry holding a copy of The Sun with a headline that says 'I've lost my wife and let my family down.' It refers to Tiger Woods, of course. 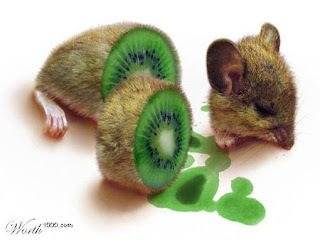 You may have seen this or variations of it ... but it still raises a smile. Thanks to designer Steve Cowell of Steve Cowell Associates for the following exchange. Here are some of our favourite typography quotes to remind us that choosing the right font and using it properly is as important today as it ever was. "There are now about as many different varieties of letters as there are different kinds of fools." Eric Gill. "People who love ideas must have a love of words, and that means, given a chance, they take a vivid interest in the clothes which words wear." Beatrice Warde. paper and a little ink." Herbert Spencer. Last year I ran a typography workshop for Sony and in the process was delighted to discover these iPod apps. Kern (59p) - you have to position a falling letter into the right place in a word. WhatTheFont (free) - use the iPhone camera to take a picture of a font and this app will identify it. The Font Game (59p) - how many of the fonts can you identify? Pretty difficult stuff. The last one comes from one of our favourite websites I Love Typography. Worth a visit. 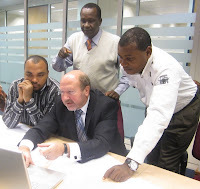 Working with four senior journalists from the Nigerian Daily Trust http://www.news.dailytrust.com in London this week. We are looking at strategy and managing change. An eye-opener for them .. and for me. Pleased to report that the Regional Press Awards look likely to go-ahead. Last year some newspapers felt going to London to celebrate was inappropriate against a background of cost cutting and job losses. Clearly, without the support of the big regional players, the awards couldn't survive. This year though there has been a positive response - a sign that things are getting better. The awards date is likely to be in June. We will let you know here when anything is decided.